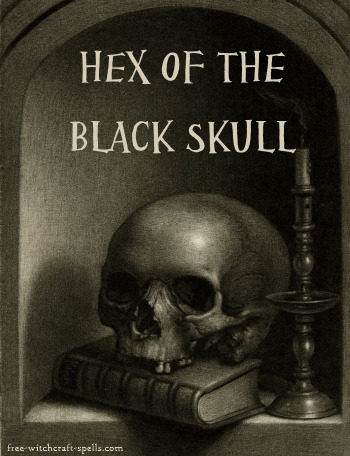 Hex spells are part of our darker black magic spell collection, and may not be for everyone. For those times you need some serious magickal power, these spells can get the job done. Not to be taken lightly. Here is a little bit of black magick to put a serious curse on someone. Make sure you read the note about using a skull. A strong note that you have to find the skull naturally, as in coming across a dead animal. By no means should you harm something for this spell. Just because it is black magick doesn't mean this is appropriate. It has to be from an animal that died without your influence. Yes, I know it may be a difficult thing to acquire, that is one reason why it's a powerful witchcraft talisman. With this skull, my will is done. May disaster come to you. As you say the words, visualize the person you are hexing. Let it cool and harden, then turn the skull right-side up. Repeat the words again as you stick the pin through one of the eye holes, and embed the point in the wax inside. Leave the hex spell charm on your altar space until midnight, then smash it with a hammer. Brush the bits together in a pile, and let it remain until you know your hex has taken effect. A little touch of voodoo magick elements with this hex spell, intended to bring suffering to someone you know. Do your best to have a real photo. If you are unable to get one, do a sketch and make sure to write their name out along with it to make the proper connection. On top of the picture, lay the nails out to make a pentagram. Keep their face in the center the best you can. Sprinkle shards of egg shell in the middle, over the person's face. Drop 5 drops of hot pepper oil over the shells. Add one more drop to each palm of your hands and rub your hands together. Hold them, palms down, over the pentagram and chant the words "rust and ruin" over and over several times. With a little oil on your fingertip, touch each of the pentagram points, then the center again. Repeat the words a few more times, then leave the spell to do its work. I suggest washing your hands immediately. Pepper oil can burn.